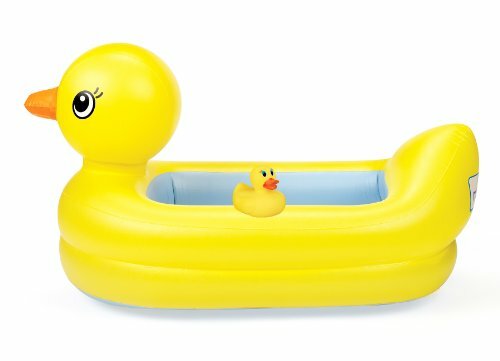 Munchkin’s Inflatable Safety Tub and Bath Ducky Set combine fun and safety for your little one at bath time. The cute and colorful tub provides safety and comfort to help your little one transition from an infant tub to the adult tub. The textured surface keeps baby secure while the contoured headrest makes hair washing easy. It drains, deflates and folds quickly for easy storage. The classic Bath Ducky is right sized for little hands and is water tight to prevent sinking, squirting and mildew. The built in White Hot technology on the tub and ducky tells you when the water is too hot for baby.